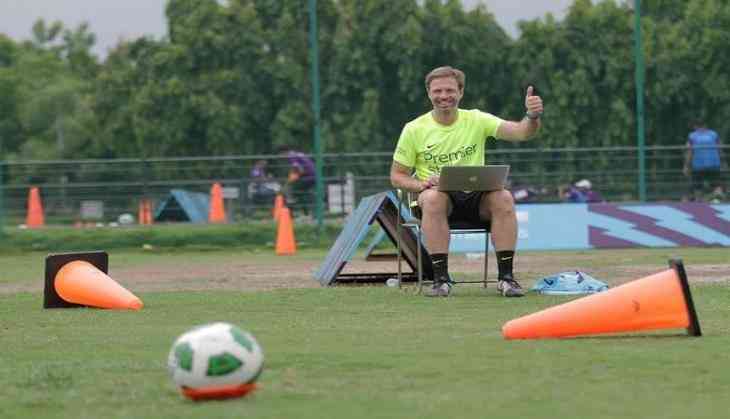 Jeremy Weeks, head coach of Premier Skills Education Programme, feels more focus needs to be put on grassroots football and not only on the elite and talent to make the sport more popular and competitive in India. In an exclusive interview with ANI, Weeks was asked about the differences between Indian and English coaching standards, to which he replied: "That there is a focus only on the elite and talent. There needs to be a clearer focus on grassroots football and making the coaching more inclusive and engaging for kids - but still learning at same time." "This is changing through and standards are improving significantly- as shown by the 60 coaches that attended this week who have been great." He also stressed that community coaching can play a key role for Indian football. "In order to have more kids playing grassroots football, we need more coaches at the grassroots level that specialise in community coaching. In turn, we need more Coach Educators to train these new coaches," he said. When enquired about the development of Indian football in the recent years, the head coach said that passion for the sport is one thing which has been on a rise in the country. "There is a definite increase in passion for football. India is one of the biggest markets for the Premier League because of the huge support - and the growth of the ISL and the exciting prospect of hosting a World Cup here in September, football has never been so at the forefront of Indian sport," he said. "This has led to more young people wanting to play and more people wanting to become coaches. This increase in participation can have a positive impact on the game here in India," he added. When asked about the shortcomings and the drawbacks of the Indian coaches and trainers, Weeks said that there is a need for Coach Educators- especially female Coach Educators. "With more Coach Educators, the need for more coaches can be addressed. And especially within the female game, where there is an increase in participation, but still a lack of female coaches and Coach Educators, and in turn a lack of female role models within the game," he said. "Premier Skills is trying to help change this by training coaches to become Coach Educators to cascade our training to more coaches across India," he added. India is now ranked among top 100 countries in FIFA Rankings and will soon be hosting the 2017 U-17 World Cup. And Weeks feel that the pinnacle tournament will definitely be a good experience for all the players involved. "I am hoping they play England at some point!" he said. The Premier League established the Premier Skills Education Programme in 2007, in collaboration with the Sports Authority of India and the British Council. Weeks has been involved with the Premier Skills programme since 2009 and has since led on the development of the syllabus for Premier Skills as well as creating a programme together with the Premier League for Magic Bus, a sports development charity in India. Since its inception, the programme has travelled to 28 countries. It currently operates in 19 countries from Afghanistan to Zambia across continents.